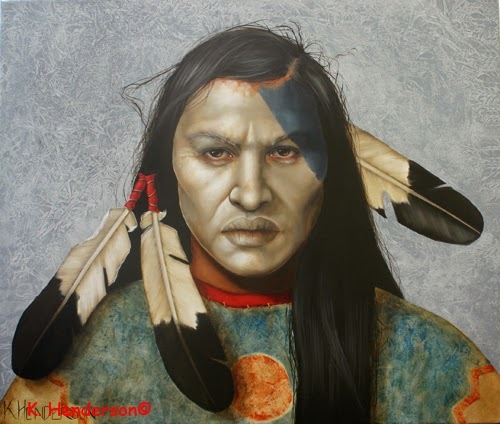 This American Indian wears a hair style that is associated with the Assiniboin Indian. He holds a shield and has a coup mark painted on his face which indicates that he has gotten close enough to touch an enemy in battle. This is considered braver than killing from a distance. 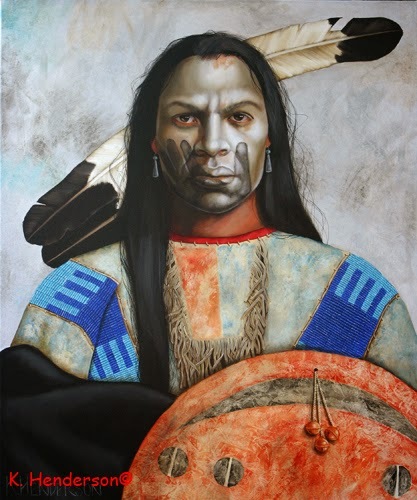 This Plains Indian has his face painted red, white and blue. He wears a Trade Blanket and eagle Feathers. 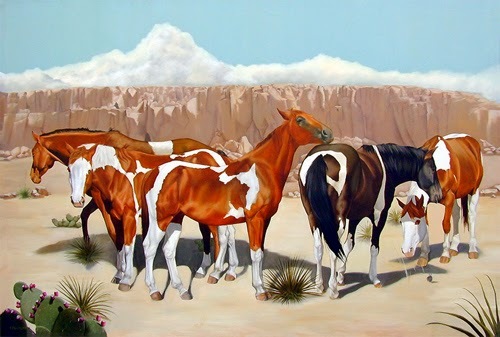 Originally, paint used by the American Indians was made from clay, grease, plants or minerals. 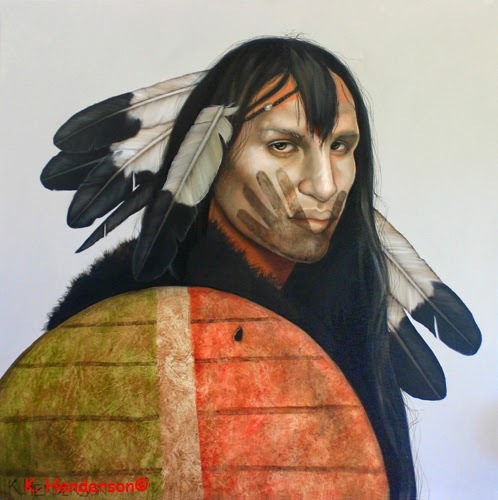 This Plains Indian carries a shield painted with Thunderbirds. These supernatural creatures are said to control rainfall. Eagle feathers are worn in the hair of this American Indian. 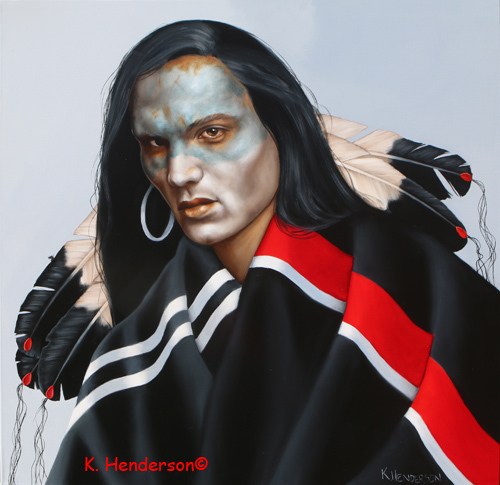 His face is painted white and red, he wears a Trade Blanket and a beaded shirt. 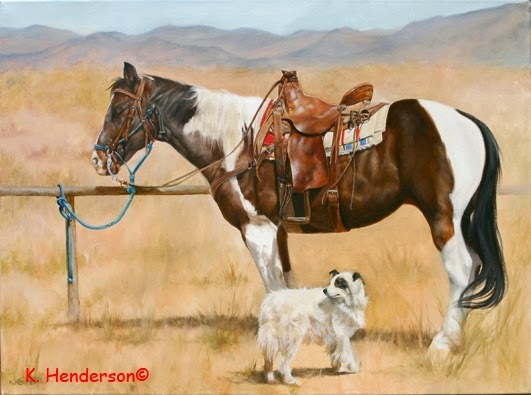 This heard of pinto horses are waiting to be saddled up for a day of work. 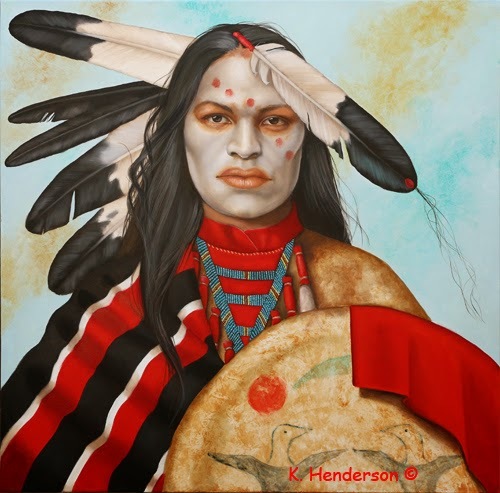 This Plains Indian wears a beaded shirt. 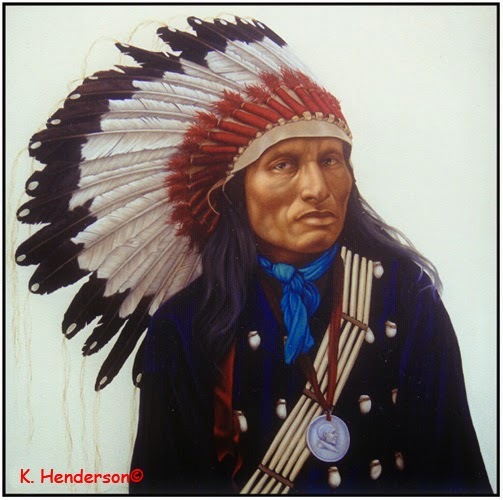 His hear is adorned with eagle feathers and ribbons. He hold a feather fan and a shield with the image of a bear. This type of shirt would have been worn in the Ghost Dance. It was said that performing the Ghost Dance would peacefully end the dominance of the white Man and return abundance to the land, including the return of the Buffalo. Forget Me Not, 36 x 30, oil on canvas. A lot of work went in to creating shirts like these. They were created by the women of the tribe to honor the wearer. This buckskin shirt has strips of beads and horse hair wrapped in trade cloth. 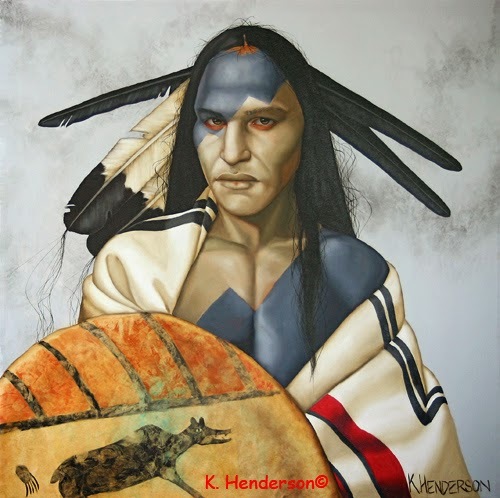 This Plains Indian is wearing a buckskin shirt painted Blue and Red. His face is painted black and white. 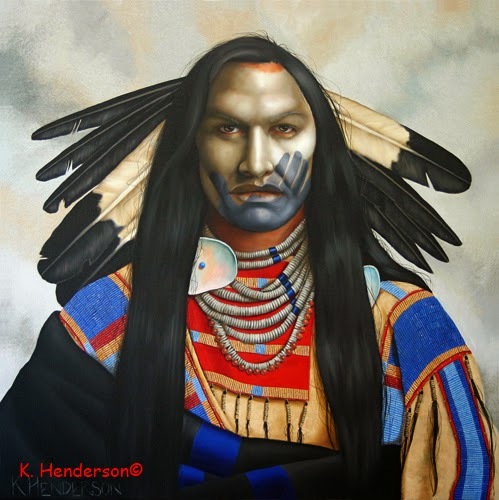 His hair is adorned with eagle feathers. 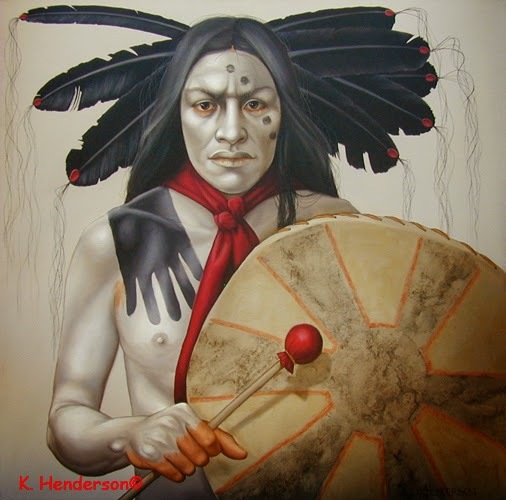 This Plains Indian is painted Black and White. 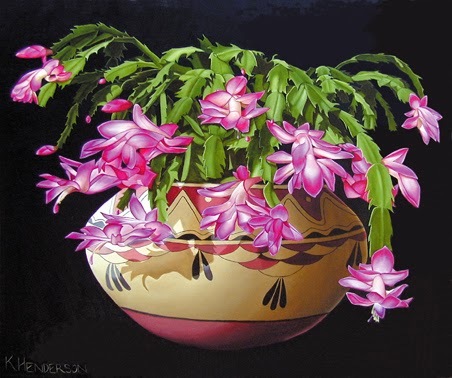 Originally "paint" was made from clay, ashes and ground minerals mixed with grease. 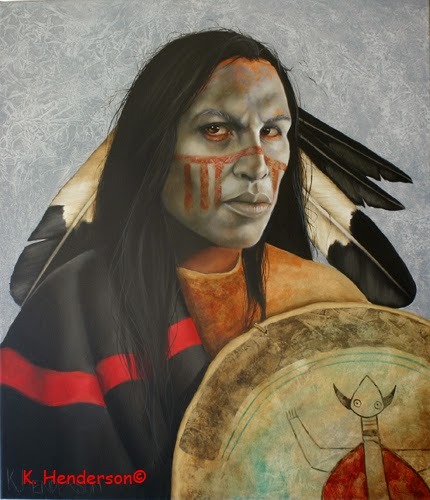 He wears a trade blanket and hold a shield which is painted with the image of a bear. 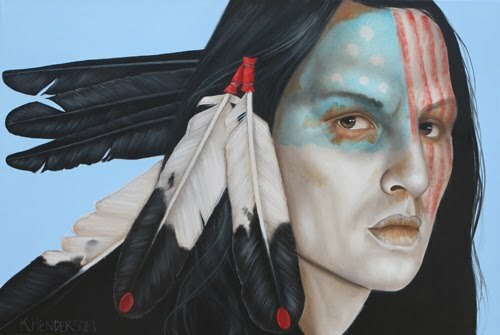 The American Indian was quick to assimilate European items into their culture. Did you know that many 'War Bonnets' are made on the crowns of felt hats? The feathers on this bonnet are attached with red Trade Cloth. The scarf is silk. The vest and skirt could be bought at any mercantile or might be government issued. Even the bones in his 'sash' are cow bones manufactured specifically for Indian Trade. 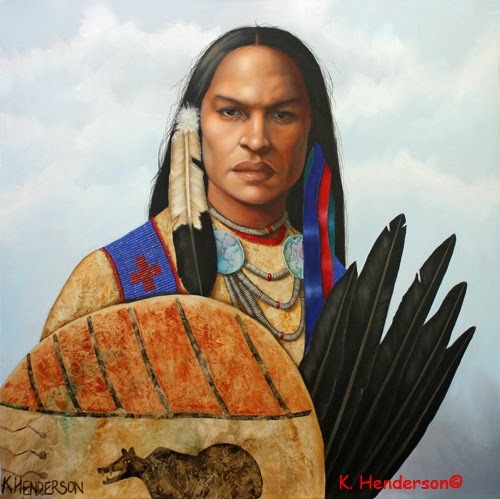 The eagle feathers and elk teeth are traditional symbols of honor and wealth. The hand on his face represents a battle honor. It is a Coup mark which indicates that he has gotten close enough to touch an enemy in battle. This is considered braver than killing from a distance. 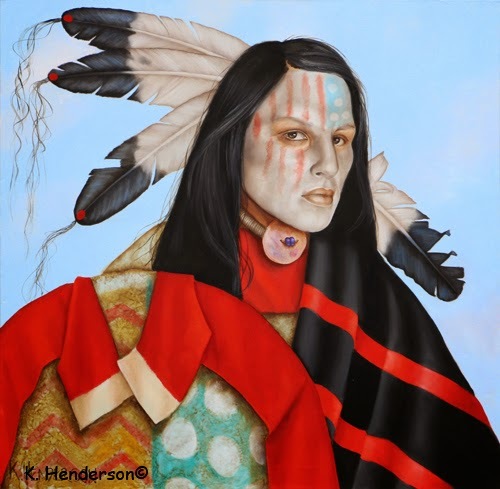 This Plains Indian wears a beaded shirt. He necklace is made of shells. 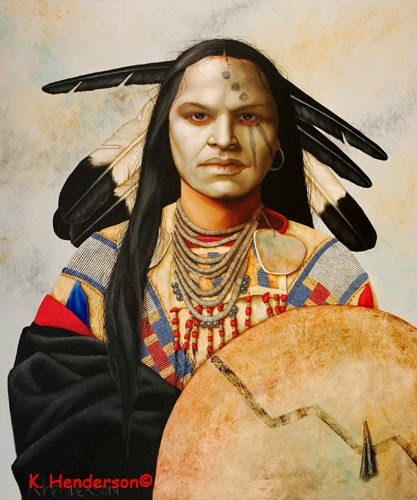 This Plains Indian carries a shield with the symbols of hail and lightning. These symbols were meant to protect the shield bearer from the forces of nature and prayer for hail and lightning to fall on the warrior's enemy. 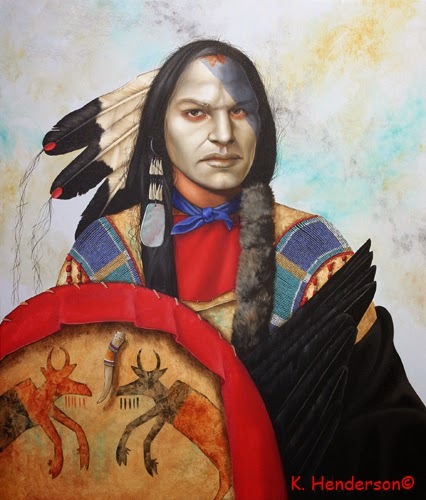 This Plains Indian carries a shield painted with Turtle. 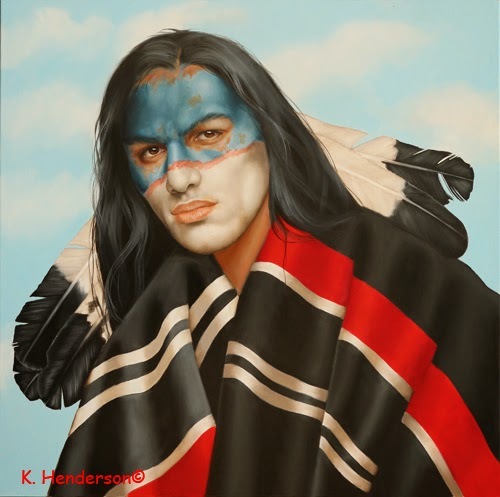 He wears eagle feathers in his hear and a trade blanket. His face is painted white and red. This Plains Indian carries a shield painted with 2 battling animals. 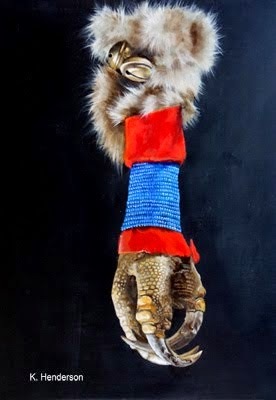 It is adorned with trade cloth and a beaded antler. 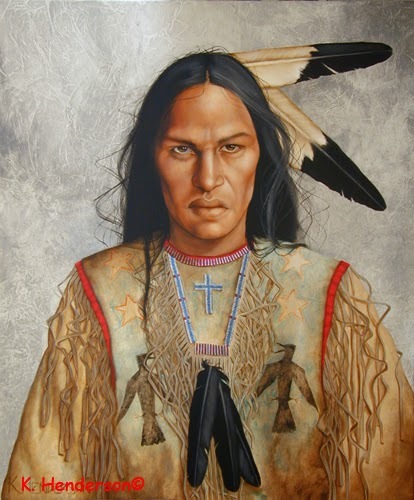 He wears eagle feathers in his hear and a beaded shirt. 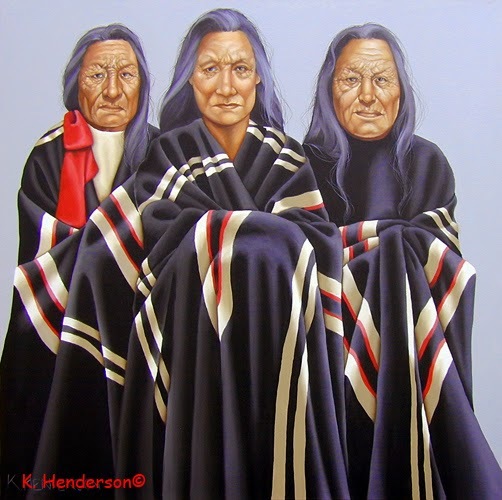 These three women wear striped Trade Blankets. Trade blankets have long been an integral part of Native American culture. They're used for clothing, bedding, warmth, ceremonial dances and gifts for important occasions. The original Indian trade blankets were the multi-striped point blankets imported by the Hudson's Bay Company from English woolen mills. Trade blankets were among the earliest items of exchange between American Indians and Europeans fur traders in the 1700's. From 1780 to 1890 the blanket was a staple in every fur trader's inventory and thousands upon thousands found their way into indigenous hands. This American Indian holds a drum and drum stick. He is painted Black and White and wears black feathers in his hair. 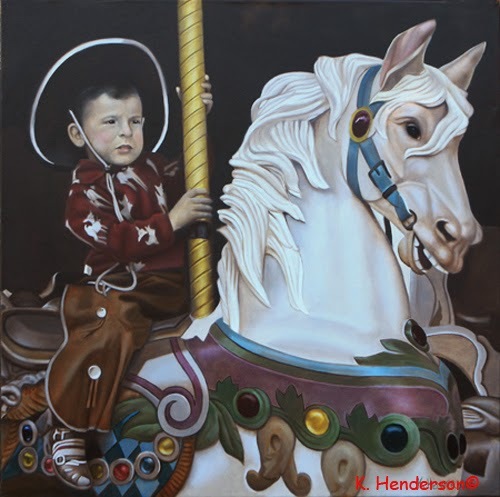 This painting shows a young Cowboy out for his first ride on a Carousel Horse. This image was inspired by a vintage sepia tone photograph. The colors are glazed on to emulate a hand colored photo. 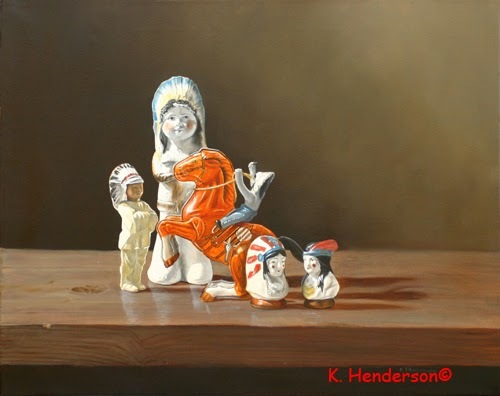 The subject of this painting is figurines you may have found in the "Olden Days": a plastic indian, a Chalk figure like you could win at the Fair, a tin horse with a Brave on his back and a ceramic American Indian salt and pepper set.